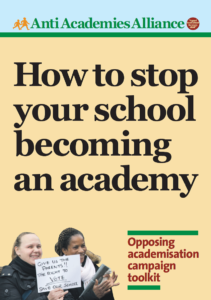 Four years after Michael Gove became Secretary of State for Education, and more than ten years after the very first academy opened, some fear that the academies programme has now gone too far to stop. Have most schools now become academies? 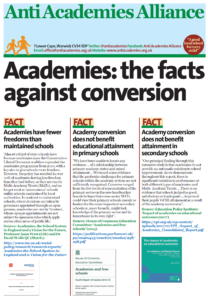 Has the convertor programme proved popular and replaced the need for sponsored academies? Are primary schools converting at an increasing rate? What does the data tell us? Rumour has it that policy wonks in the DfE are hard at work on how to manage “market failures”. Indeed the number of failing academies is soaring. But then ‘failure’ is hardwired into a system of rationed exam success, the ever-changing goalpost of OFSTED and unbridled greed of ‘social entrepreneurs’ who now claim they have a special responsibility to transform education. Peter Hyman – pass the sick bucket please. Documentary on academies wins award. 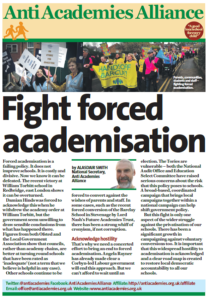 Posted in News, Research, Resources	| Tagged Forced academisation, Statistics	| Comments Off on Documentary on academies wins award.